He studied at the Moscow school of painting, sculpture and architecture (1854−1857) K. I. Rabus and A. K. Savrasov. From 1857 great artist III degree, in 1869, academician and one of the founders of the Association of traveling exhibitions, participated with their works at these exhibitions from 1871 to 1884. Depicted various aspects of rural Russian nature truthfully, and often with humor. From his paintings it is necessary to mention: "View from the outskirts of Porechye", "Red pond in Moscow in autumn", "Winter road", "Spring". The last three are in Tretyakov gallery, in Moscow. The artist Lev Kamenev was a painter, a subtle lyrical talent. A favorite student and friend of A. K. Savrasov, he was not a revolutionary in the field of painting, did not differ by experimentation, alien to him was any pretentiousness, the tendency to "self-expression for-expression". Lev Kamenev was born in 1833 in the city of Rylsk in Kursk province in the family of a petty merchant. Childhood and adolescence were spent in Astrakhan, where he studied at the local grammar school, but did not finish it, as my father needed a helper and took his son to his shop. The lion went 21st year, when he in 1854 he went to Moscow and entered the School of painting, sculpture and architecture. At the same time the students of the school were future celebrities of I. I. Shishkin and V. G. Perov. First, his teacher was the landscape painter Karl Ivanovich Rabus. 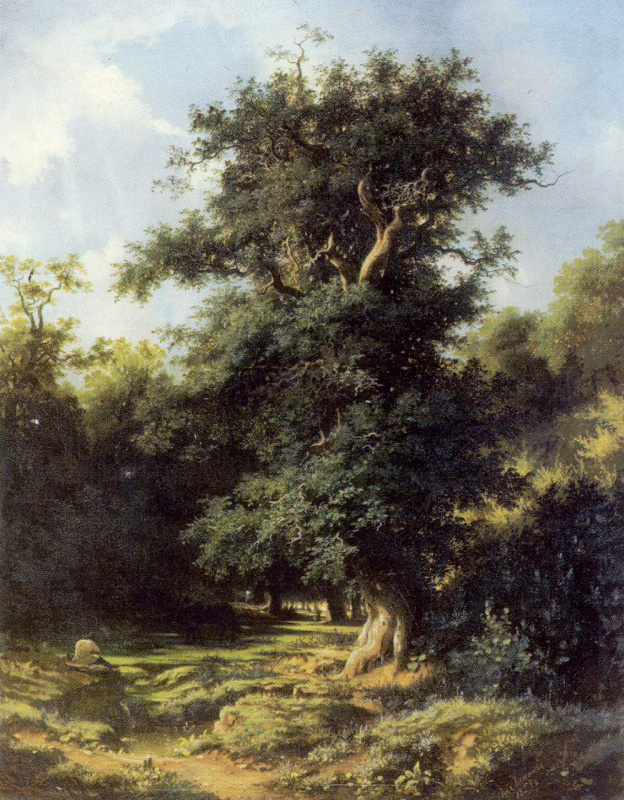 When Rabus in 1857, died in his landscape class was replaced by a student of Karl Ivanovich still young, then Alexei Kondratyevich Savrasov. Over time, Kamenev and Savrasov became close friends: they were practically peers (Kamenev was younger his teacher for three years), but most importantly, they were United in their common system of the soul. Family Kamenev, apparently, was not wealthy, as some argue, but on the contrary, very poor. In 1858 L. L. Kamenev received the title of class artist. One of those who was not a graduate of the Academy of arts, was awarded to only those who passed the exams and submitted my entry. In the same year Kamenev became a member of the Moscow society of lovers of the arts. Then he immediately began to take an active part in the then fashionable Periodic exhibitions. The best paintings received monetary awards and are well sold out. In the summer of 1858 Kamenev went to the island of Valaam, where at the time he wrote sketches of his fellow College of I. I. Shishkin. On the island, young artists are working in close proximity to each other, which contributes to their friendly approach. However, the work of each of them goes his own way, following the voice of his imperious personality. Next year Kamenev finished two wonderful landscape — "Old oak" and "Landscape with cottage". 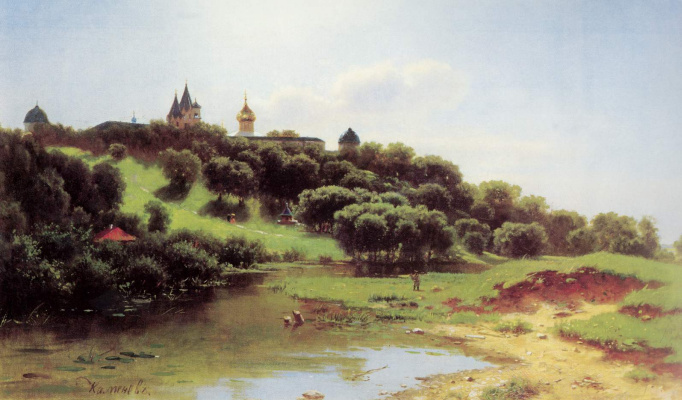 In 1860, Kamenev, ends the "Landscape with river" (1860). For a long time it was not known what Museum holds this work. It should be noted that Kamenev often find myself "guilty" in what difficulties sometimes critics when trying to identify his paintings and determining their location. The fact that almost all the pictures of the paintings are monotonous, and even just the same name. In 1860, Kamenev successfully participated in the exhibition of the Moscow school of painting, sculpture and architecture. In the presented work there the criticism was the ability of the young artist "to steal from nature the secret of her charm". 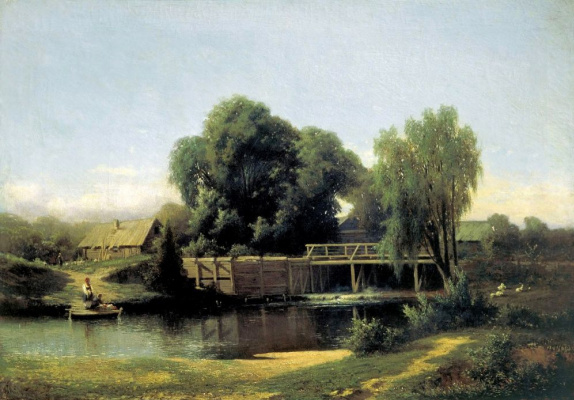 The beginning of the period gained an artist of maturity and creative independence, departing from the unwitting imitation can perhaps be dated to 1861, when it was written works such as two paintings with the unpretentious title "Landscape" and "Sunset on the Mologa river". In 1863, with the assistance of the Society of arts Kamenev went two years abroad. There he visits the Museum of fine arts, the artists ' studios. 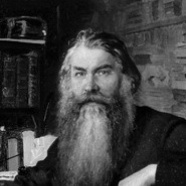 Meeting in Switzerland I. Shishkin, Kamenev went with him that summer to work in the Bernese Oberland. After working together all summer, leaving artists: Shishkin in Zurich, Kamenev in Munich. Visited Lev and at the exhibition in Paris, where were the famous landscape painters of the Barbizon school, of which there was a lot of talk in art circles. 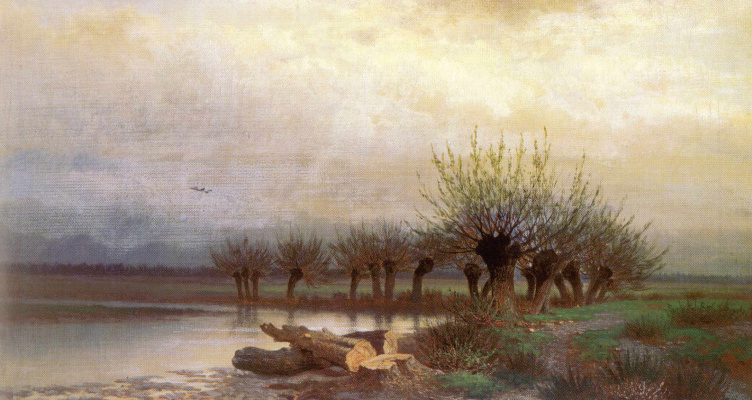 In Germany, L. L. Kamenev wrote his famous work "the Teutoburg forest" (1864) and "View near Dusseldorf" (1865, Ivanovo art Museum). Friendships Kamenev and Shishkin continued in Russia. It is known, for example, that in the summer of 1865, and together they painted landscapes in a forested area near the village Bratceva. 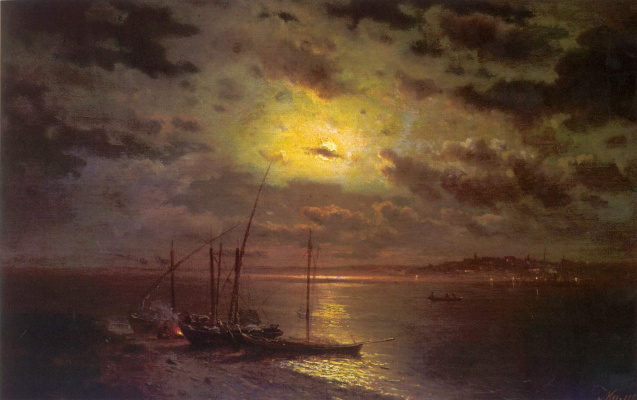 In 1865 the St. Petersburg society for the encouragement of fine arts established the annual contests with cash prizes for the best works of genre and landscape painting. In the same year was held the first contest. The winners in this are: in the category of genre painting of V. G. Perov’s painting "Peasant funeral" and in the category of landscape and L. L. Kamenev for his film "sandbar". 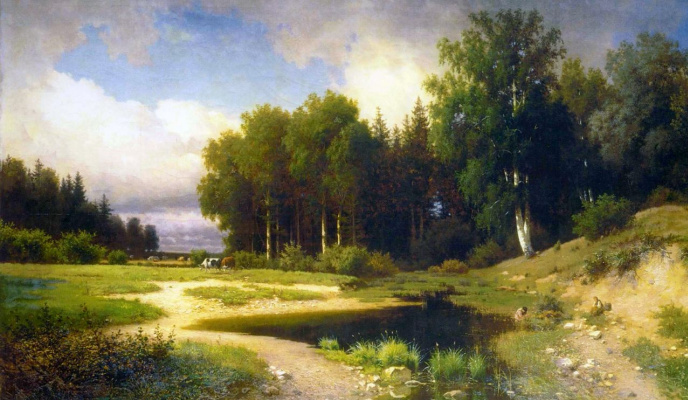 In the same period, soon after his return to Moscow, Lev Kamenev drew the attention of several bright national landscapes: "Haymaking", "Winter road", "Spring" (1866). The painting "Haymaking" was submitted to the contest landscape, hosted by the Society of lovers of the arts, and won first prize. In 1867, the stone gets the title of class artist of the 3rd degree, which further brings him closer to the title of academician. In 1869 for landscape "Winter view from the outskirts of Moscow and View from the vicinity of the village of Porech’ye", Kamenev received the title of academician. The last picture was awarded first prize at the competition of the Society of arts. Already I traveling exhibition in 1871, the stone exhibited two landscapes: "the Fog. Red pond in Moscow in autumn" and "Summer night." Both paintings had considerable success. In the newspaper Sankt-Peterburgskie Vedomosti V. V. Stasov, the "speaker of the era," as it was then called, in the article "travelling exhibition" in 1871 wrote about these paintings: "Both are extremely poetic, both wonderfully written. Maybe even better Summer night, where the effect is gently illuminated by the moon thin clouds, a small Bay between the dense forest coop, flashing lights in the side, grazing a herd of horses in the distance — all this is peerless to the highest degree." Soft and subtle lyricist, despite the "imperative" remains Kamenev, and in 1870-ies. In 1872, Kamenev writes a series of landscapes, among which we should highlight two big good luck. This "Harvest" and "Landscape with river". 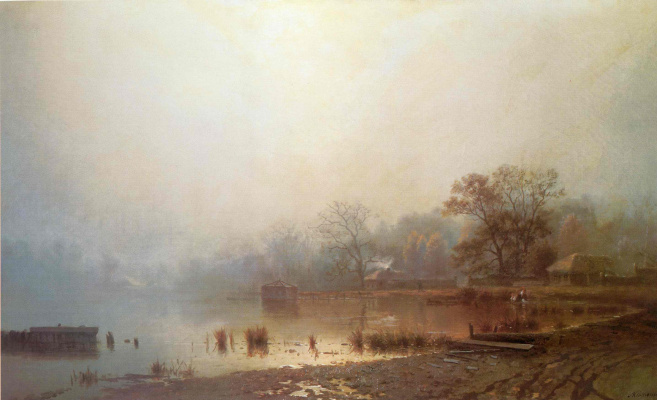 From the end of 1860-ies the artist worked near Moscow, in particular in Savvinskaya Sloboda near Zvenigorod. These places always called Moscow Switzerland. Here in the picturesque places of Moscow region is located the ancient Savvino-Storozhevsky monastery. The beauty of the monastery complements and enhances the feature of its location: it is visible from everywhere while on the mountain Guard (Guard mount) at the confluence of the Lodge in the Moscow river. In these picturesque places, the artist had written such famous paintings as "Savvina Sloboda near Zvenigorod. 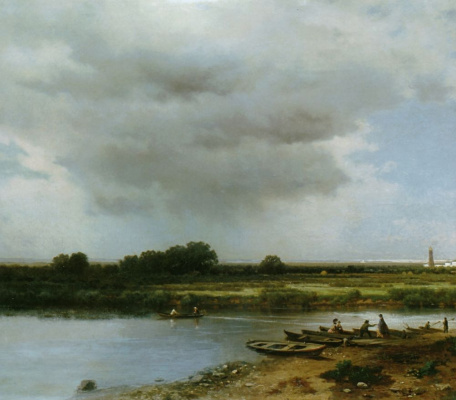 Rain," 1879; "the View from the vicinity of the village of Porech’ye", 1869; "the Savvino-Storozhevsky monastery near Zvenigorod", 1877; "Savvinskaya near Zvenigorod Posad", 1879; and others. In recent years, the painter lives almost continuously in these places, Sawin Sloboda, lives alone, impoverished solitary man taking off a half of a peasant’s hut. In Savvinskaya Sloboda came to work and the long lived A. K. Savrasov, I. Levitan, brothers C. A. and K. A. Korovin and other artists. 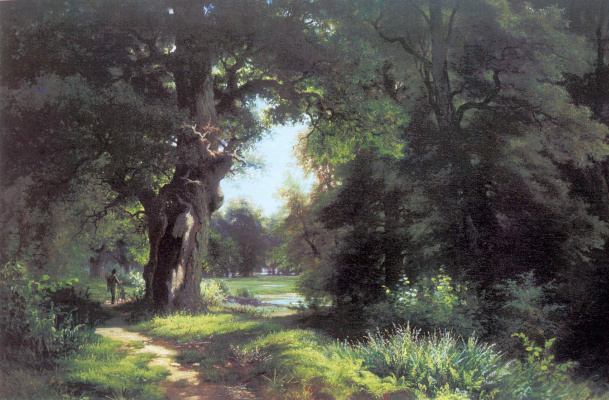 In 1884, Kamenev writes his last significant picture of the "Creek", for which he received the first prize of the Society for the encouragement of arts in 1884. About the last period in the life of Kamenev, little is known. Apparently in connection with disease ("bitter drink") in 1880-e years he almost does not participate in exhibitions. Visited him in a neighbor’s young Konstantin Korovin, who came often with his brother to work in these beautiful places. In his memoirs Korovin conveys the bitter words of an older friend: "I sorrow had their fill. That’s the only one left. Two wives had died. One was out. Who should, and to tell the truth. Here in the village all need roam. Here buried two children. For a long time. Fell ill, died…"
But it seems that the main cause of mental breakdown and as a result, the "Russian disease" lay deeper. The leitmotif of the complaints "old" there was a feeling of being misunderstood, uselessness and uselessness of his talent. Once his "dusk" brightened up "smile farewell" last success: one of the paintings Kamenev was bought by Emperor Alexander III. Soon, 14 (26) January, 1886, he died. He was only 53 years old. He died in poverty and loneliness.